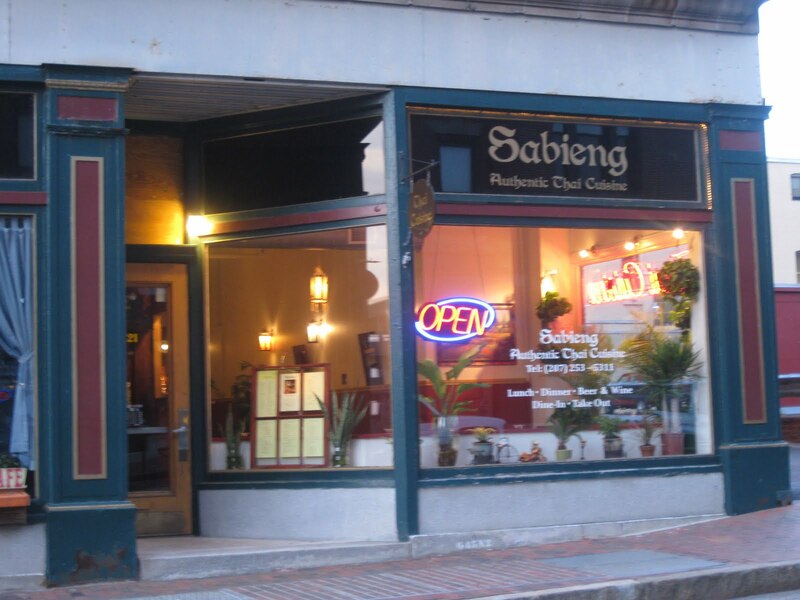 The atmosphere and menu at Sabieng are unassuming; there's no $1 sushi nights, no offers to toss shrimp into your mouth. Instead, the restaurant sits down the block from the intersection of Forest Ave. and Congress St., quietly serving a fairly standard array of Thai dishes. M. and I stopped in for take out last night, and aside from Jenner and her husband on their way out, the restaurant was empty. While we waited for our food, the woman behind the counter came out and offered us two fried veggie rolls. She apparently had heard me kvetching about how hungry I was while M. dilly-dallied over the menu. I went with my go-to: chicken Panang curry ($10) with 2 stars. I loved the variety of still crisp vegetables; so often curry comes with only peppers and onions. Sabieng's has carrots, green beans, and red peppers. Hm, well, now that I type that, I guess it's not a huge variety, but I appreciated the green bean touch. The curry was spicy, but tempered by sweetness, plenty of Kaffir lime leaves, and basil. M. ordered the pork Pad Prik Khing ($10) also with 2 stars. 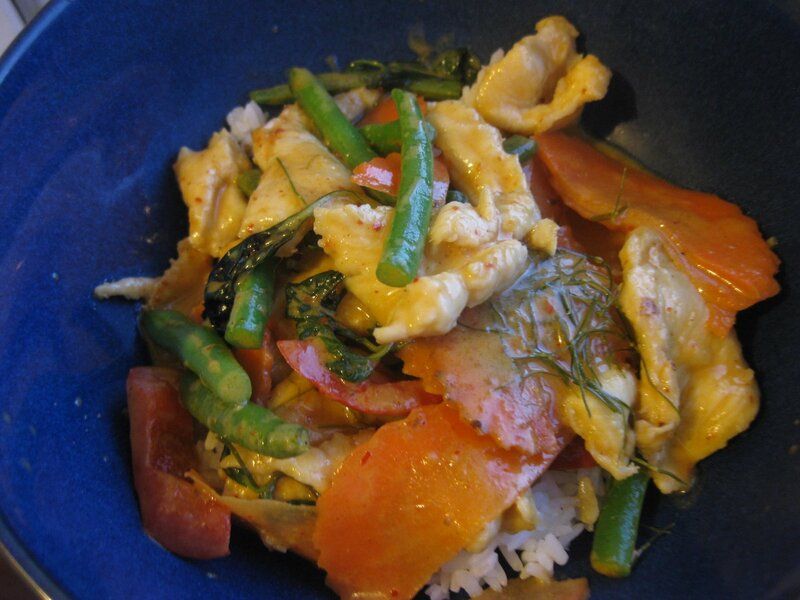 His dish was noticeably spicier than mine; maybe the Pad Prik Khing curry is just spicier than Panang curry. 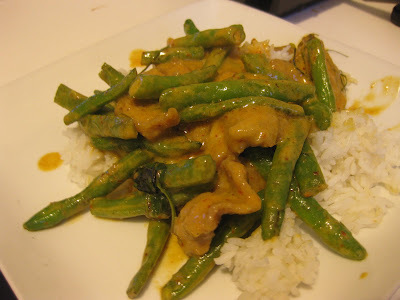 But the pork was tender and flavorful and the green beans gave the dish a nice crunch. I don't know how good business is at Sabieng; after all it's tucked around a corner and is right down the street from the more popular Pom's. But between the hospitality we received and the fresh ingredients, I'd recommend adding this place to your short list of great Thai restaurant in Portland. I love this place. Not only was it my first experiance with Thai food....but it is where my husband took me to dinner after he proposed.... I can see the table we sat at through the window in the picture you posted. I had orange chicken, which I loved!!! We also had dumplings, and I tried a yellow curry. I remember it being so yummy!!!! !.....I will definitley be going back on our next trip to Maine.